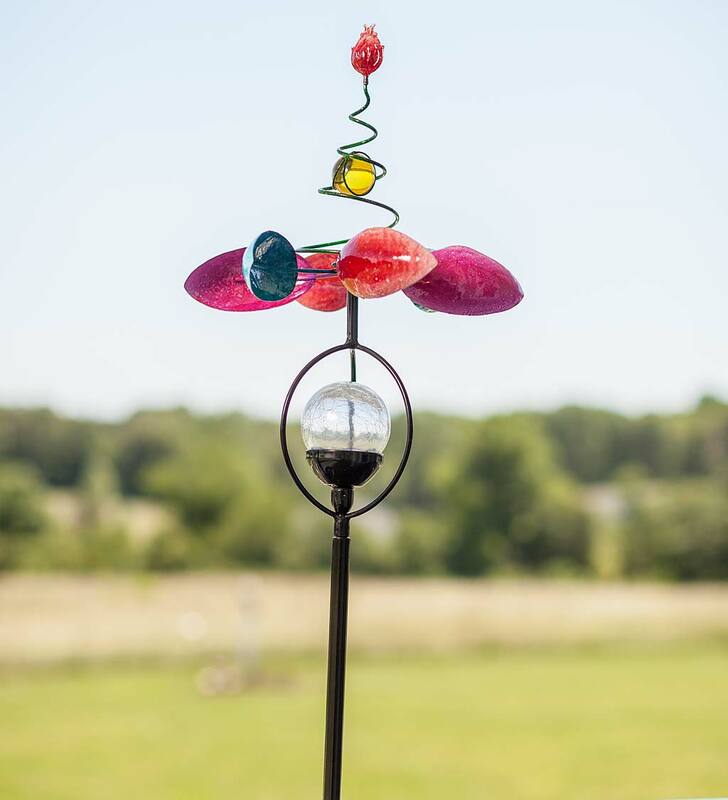 Our Solar Confetti Wind Spinner with LED Lights is an eye-catching spin on our best-selling Confetti Spinners. For a fantastic show day and night, this garden spinner's patented design features a solar panel built directly and seamlessly into the wind spinner's center. Several of the solar garden spinner's colorful metallic circles are embedded with tiny white LED lights. During the day the solar panel soaks up the sun and when the blades spin at night, you'll see a circle of light! An entertaining accent for any lawn or garden. Metal construction with a painted finish. 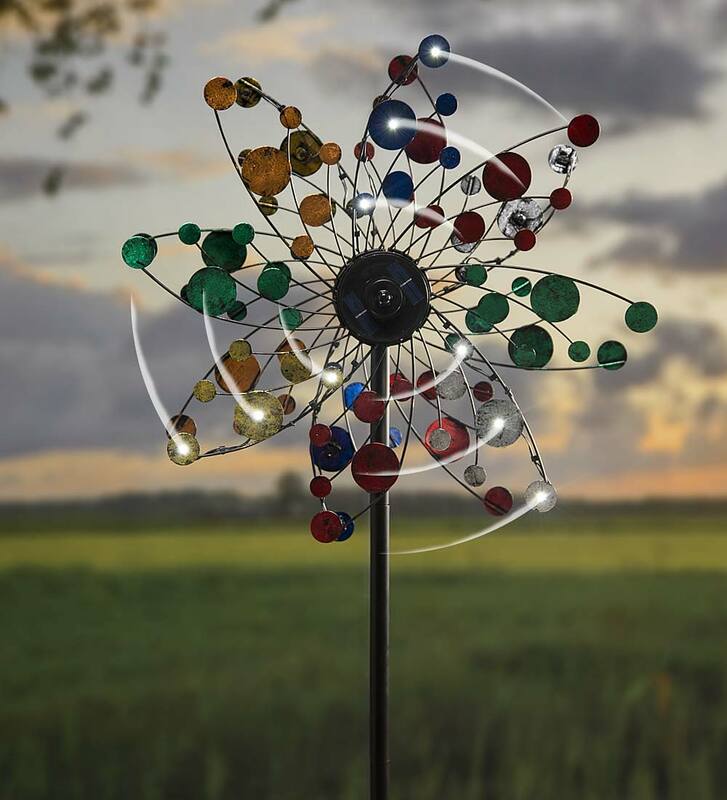 Brighten your yard with the abstract style and motion of our Single Flower Spring Spinner with Color Changing Solar Ball. Spinning petals create a brilliant show rotating at the base of the center spring accent with colorful glass ball. You'll be mesmerized by the hypnotic, kaleidoscopic effect. The light and airy design is a lovely addition to any yard. Plus, a crackle glass, color-changing solar ball lights up at dusk for a great show. This spinner is fun day and night! Metal with a colorful high-gloss finish. Sturdy metal pole with ground stakes. Easy assembly. 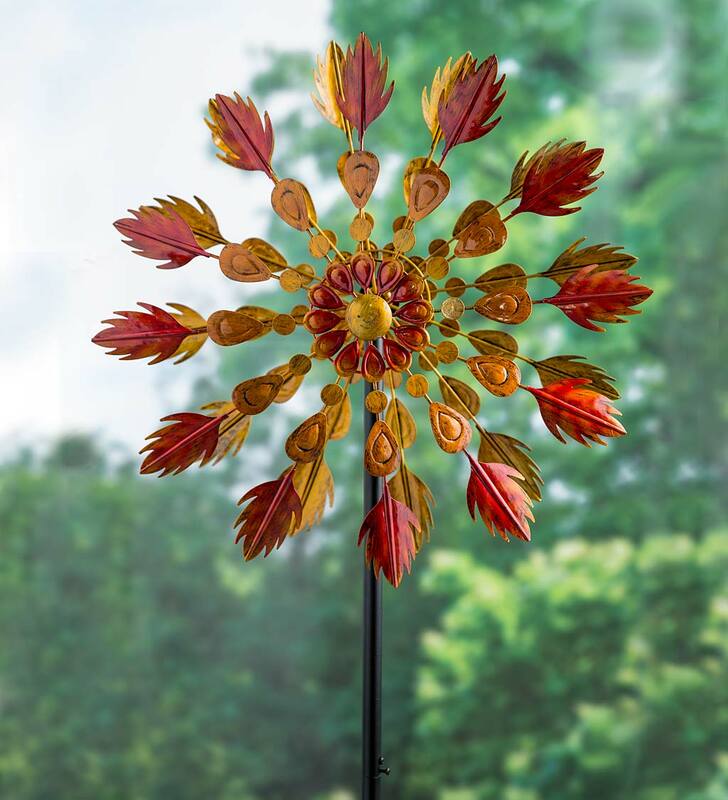 Our Fall Feather Wind Spinner is an eye-catching accent that will add plenty of color and motion to your off-season landscape. This spinner will surely bring vitality back to your landscape, especially in the winter months when the landscape can lack color and warmth. Beautifully shaped "feather" in fall shades make a mesmerizing fall autumn display. Watch as the breeze sends the bidirectional rotors into a whirlwind of spin for an amazing display of art in motion. Mount this painted metal spinner anywhere in your landscape: garden, front or back yard, flower bed, along a pathway. The sturdy black metal post has a three-prong stake for secure installation. Yellow Flower Studio M Kaleidoscope Spinner, 18"